There are a lot of pre workout supplements available to bodybuilders and strength athletes. Some of these work great and others don’t work well at all. Some give you a nice steady boost of energy and some give you the jitters and leave you crashing hard after it wears off. 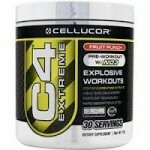 One pre workout supplement that I have been using for the last 2 week is Cellucor C4 which i will review below. Do You Crash As It Wears Off? Does It Give Good Pumps? C4 pre workout supplement has given me a great boost of energy that helps me power through my workouts. The energy comes on pretty smooth and lasts for about an hour. Its does not feel like a nervous energy but instead a more intense focus type of energy which is nice! It has also increased the intensity of my pumps as well which is very nice!! Not at all in fact once the C4 starts to wear off I really noticed no crashed feeling or any other negative affects.The tingle feeling in my skin slowly goes away and I go right back to feeling my normal self. It really comes on and goes away very smoothly. About the only side effect I have noticed is that it makes my skin tingle which is normal for many pre workout supplements. I also seem to have gotten used to the 1 scoop dose rather quickly and had to increase it to 2 scoops to get the desired effect. It has not upset my stomach at all! To be honest the pumps that C4 provides are not as strong as other pre workout supplements, with that said my focus is more on the energy then the pump. But if you are pump focused then Cellucor C4 might not be your best choice. The taste is actually not bad, watermelon was a little funky as was pink lemonade but nothing to bad. My favorite is the Blue Razz and fruit punch. They all have a sort of tang to them but mixed with 6 ounces of water its pretty easy to slam without any required effort. The average retail cost for Cellucor C4 is about $29 for the 60 serving container and one of the best ways to find the best price is to Buy Cellucor from illpumpyouup.com or amazon.com as they always tend to have the lowest pricing and low shipping costs compared to many other online retailers! Verdict: I would Definitely Recommend Cellucor C4 To Anyone! If you are looking for an affordable pre workout supplement that will give you smooth energy level transitions and be easy on your stomach then I would have to recommend Cellucor C4. While it is not the only pre workout supplement on the market in my opinion it is one of the best! Remember to check with your doctor before taking any pre workout stimulant!